I made these postcards after I received a pattern from Maureen in the mail on how to make a 3D bow tie block. 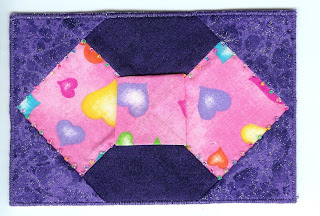 The bow tie block was very easy to make and I couldn't stop at making just one. I mailed the pink bow tie postcard yesterday, and the little bow tie postcards out today.